A simplified method for approximation of an IRST range. Greetings. 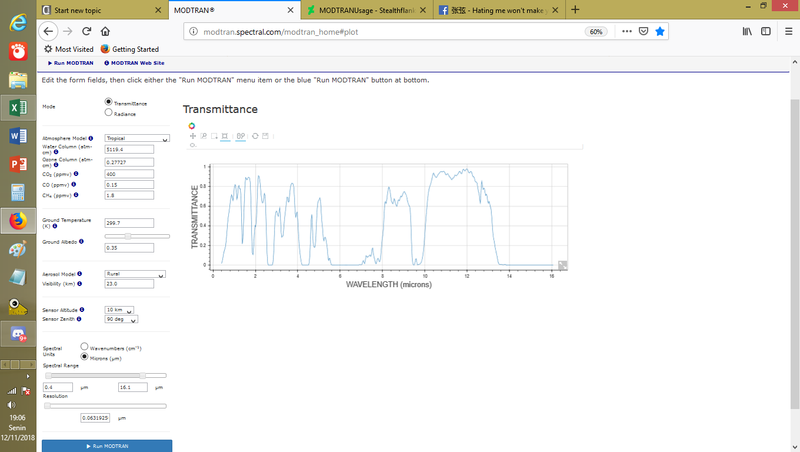 As the title said, here i would like to present and discuss about a simplified approach to approximate detection range of an IRST. I feel that this is a necessary topics mainly because so far, no real quantitative comparison or even discussion exist. Every Optical sensor equipment manufacturer usually only mention range without having a real standard on what target being used and testing environment. 2.Robust, means that it allows wide coverage, say estimating target infra red signature in any IR band of choice. 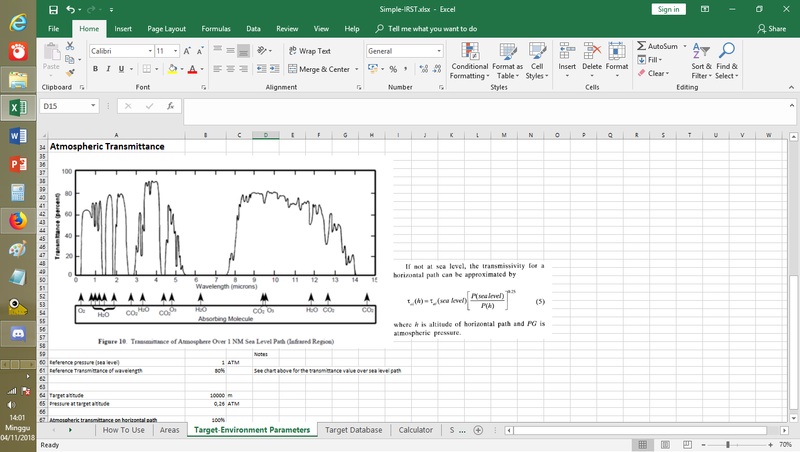 The method i am using here is basically a simplified version of IR range equation presented in E.Fleeman's Tactical missile design 2nd edition. The simplified method, as like one you may see on Radar relies on inverse square law and require a reference value to work with. Here i would like to use the new OLS-35, as reference. Why ? 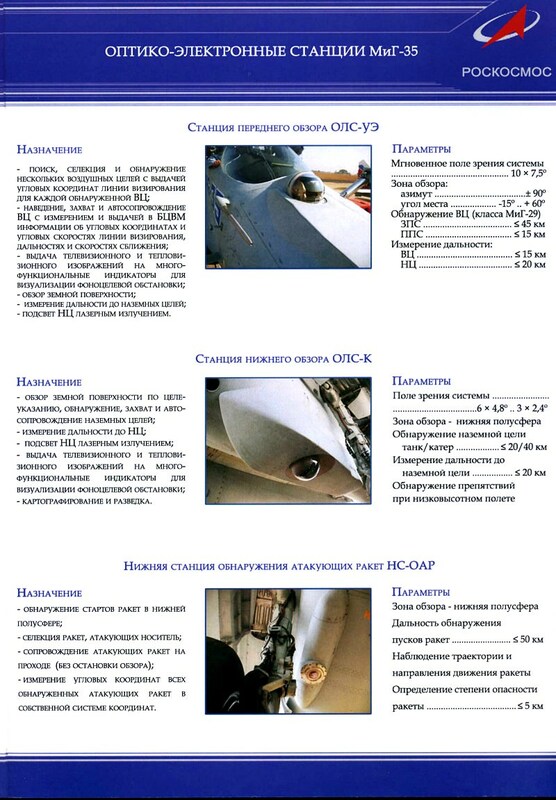 As we see in the brochure it has range figure and a reference target. 1.Finding relevant data and establish the assumption for both target and the IRST sensor. One may ask on why i only include the fuselage area. This is because of the resolution of available imagery does not seem to be enough to conduct a more accurate assessment. Plus there are no real easy method to include or measure the projected area of the wing which need wing thickness. information which would be difficult to obtain. I consider that the fuselage alone would be sufficient. For the calculation of detection range from the rear aspect. The IRST is assumed to be "snooping" inside the jetpipe. and the area of the infra red emmission source would be assumed to be the sum of the jetpipe frontal area. Now that we have established the assumption and necessary variables. we can head to the 2nd step. Now we need to estimate the Radiant intensity or the intensity of the energy being emitted by target on the operating wavelength of the IRST. Should you wish to estimate engine jetpipe emission, you can just directly input the temperature of the exhaust temperature (The exhaust temperature here is defined right after Turbine outlet) The emissivity parameter is by default 0.6 as i dont really know what value i should use, probably 0.9 or more as the aircraft engine inside are clearly not reflective. The second thing after inputting the necessary variable would be defining the working waveband of the IRST at "Detector Operational Wavelength" Here you can define the first cutoff of operating wavelength and the 2nd one. OLS-35 is known to have operating wavelength of 8-12 micron. Thus 8 is the first cutoff while the 2nd cutoff would be 12. Same if the detector operates in more wavelength Say 4-12 (covering both mid and long wave IR). A target table that contains the pre-calculated value are also available. You can manually add your own target, just make sure to type the necessary assumption regarding flight speed and altitude. If one desire to calculate the IR signature from the rear, one simply need to enter the jetpipe temperature and the area of the engine rear face as input. If there is two engines, the area is basically both engine added. 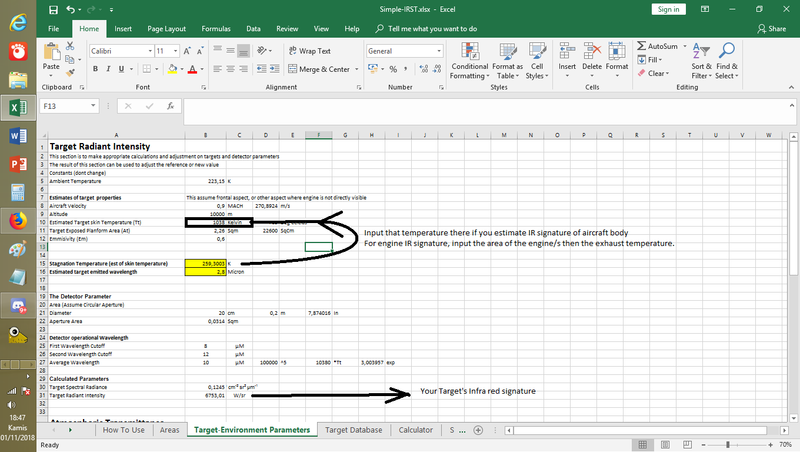 After calculating or selecting the necessary value of IR signature (Reference and target). We can move to the 3rd step. The atmospheric. The method contained in spreadsheet is unfortunately only based on Gas as main "absorbent" for the IR wavelength. However for early approximate it should be adequate. The spreadsheet contained a chart with sea level transmittance value of IR wavelength. The altitude parameter here is tied to the altitude column (at the moment as i am still developing this sheet). 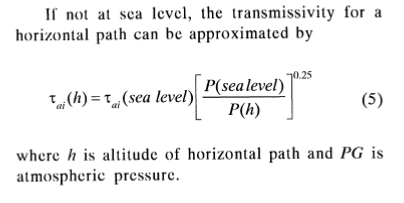 Finally the value can be read on the coloum "Atmospheric transmittance on horizontal path". It allows for multiple environment factors and other variables not covered in the sheet. Regarding usage, there is one convention namely angle of view (sensor zenith). 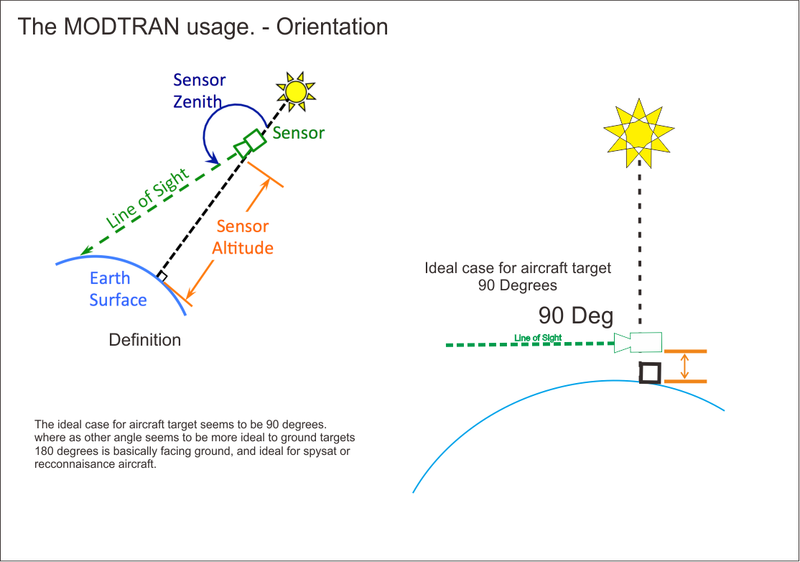 90 degrees appears to be suitable for the aircraft, while larger values are more suitable for ground targets or reconnaissance satellite purpose. And someone may ask "Hey isnt that for 10000 m altitude while your reference value is for 12000 m ?" Then we can use the following equation to estimate the value. Except that now it use the 10000 m as reference. Where P is pressure and the greek alphabet Tau denotes the reference altitude's transmittance factor. 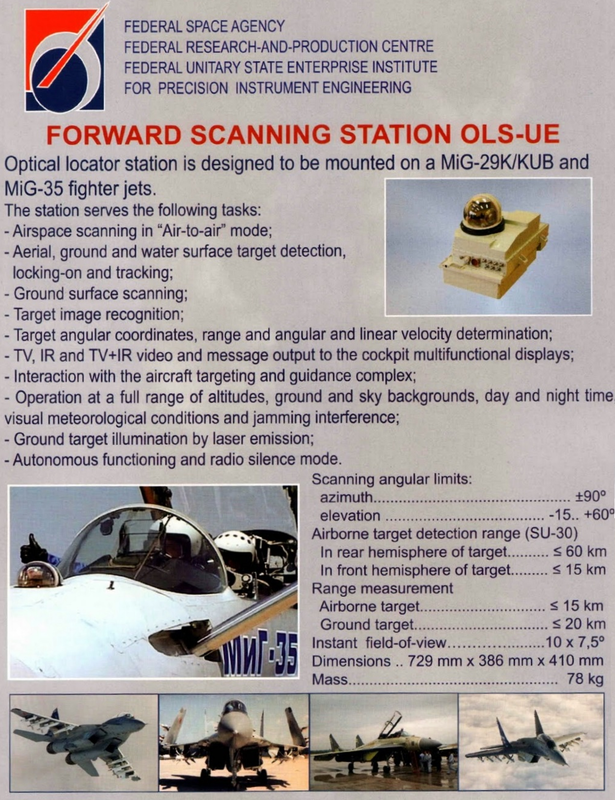 Reference Value for OLS-35 Data. and found the detection range to be about 86,39 km. Now one might wish to make a "what if" scenario on "how about if i can enlarge the IRST how far it can enhance range ?" one can simply change the IRST aperture diameter at "IRST Aperture Diameter" coloumn to the value of his desire. In this scenario we choose to "enlarge" the OLS-35 optical aperture to 40 cm (0.4 m) and as we see we have range of 172 Km against F-22 Raptor on Supercruise and 86 km for non supercruise mode respectively. The spreadsheet contains ICAO atmospheric model. Which accurate up to 22000 meter. 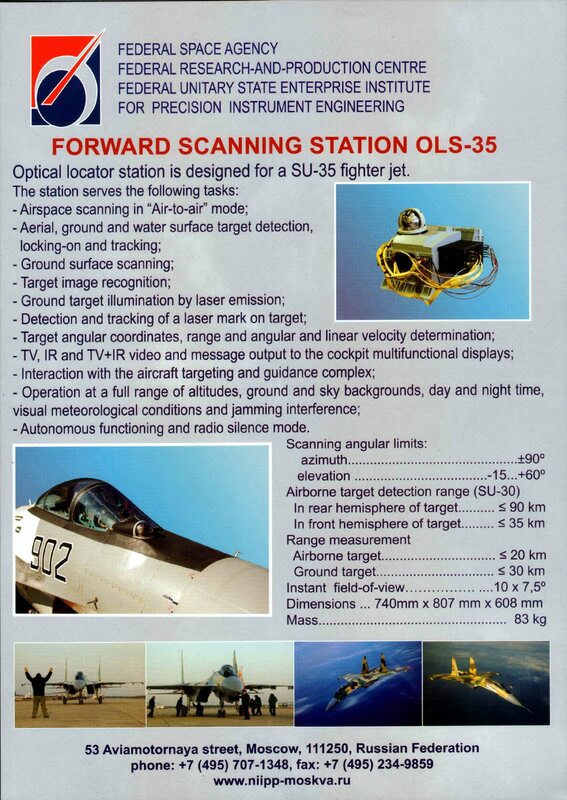 Isn't the detection range of OLS-35 supposed to be 35km against head on Su-30? a "what if" scenario on "how about if i can enlarge the IRST how far it can enhance range ?" one can simply change the IRST aperture diameter at "IRST Aperture Diameter" coloumn to the value of his desire. 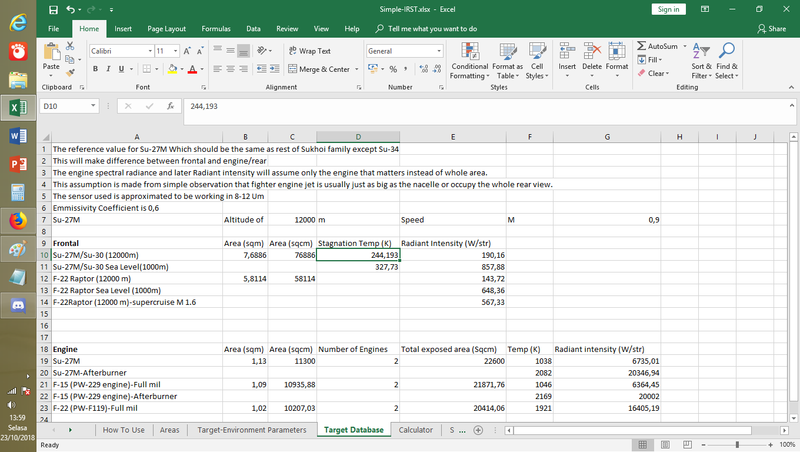 In this scenario we choose to "enlarge" the OLS-35 optical aperture to 40 cm (0.4 m) and as we see we have range of 172 Km against F-22 Raptor on Supercruise and 86 km for non supercruise mode respectively. That is the diameter right? Last edited by garryA; 13th November 2018, 03:01. The diameter was 20 cm. What am i saying there is a what if scenario when we enlarge that 20 cm to 40 cm. You can of course easily, re-adjust the value as you wish in the spreadsheet as it meant for use. All times are GMT. This page was generated at 02:11.